With over 20 years of experience, Shaun McDevitt decided to go out on his own to open McDevitt Electric two years ago. Based in Portland, McDevitt, a master electrician, can handle all electrical work, both residential and commercial. electrical work on remodels, new construction and offers service, like fixing an outlet or putting in new recessed lighting. “I like service. It’s taking care of business and I can do many calls a day.” Service calls are where the majority of his experience comes from. He ran an electrical service van for 15 years, traveling all over the area to fix issues. He enjoys the trouble shooting aspect of finding what the problem is and fixing it, he said. He has worked for three different companies in the last 22 years. “I had a lot of longevity. The longer you work for someone, the more tired you get of making money for someone else,” McDevitt said. McDevitt Electric has competitive prices for the quality work he offers. He sees customers within an hour of Portland, which is roughly an area from Augusta to Wells. He has been involved with big projects like the Family Dollar stores in Standish and Naples and work at Aubuchon Hardware in Windham. “I’ve done it all in commercial,” he said. McDevitt first started learning electrical work through the vocational program in Portland while in high school. After he graduated, he moved to Florida, which required more electrical training to be able to work there. Maine requires 546 hours of class time to get a license and McDevitt has 1,100 hours of initial training, plus he does continuing education hours every year and is re-certified every three years. When he was a kid, his dad was a jack of all trades, working on buildings in the Old Port. 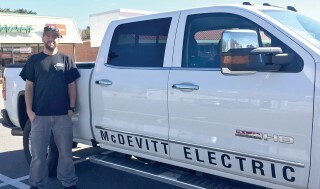 His dad told him “to be a master of something.” That stuck with McDevitt as he strived to become a master electrician. He works by himself primarily, but has some key people he brings along on larger jobs like new construction and remodels. “I juggle it all, but service is a priority,” McDevitt said. He is booking a little over two weeks out for small jobs like recessed can lighting, but can be reached most days for emergencies and quick jobs. He is honest and fair with billing for his time, not nickel and diming his customers. Some homeowners may discover potential trouble while making renovations that require opening up walls or tearing them down, exposing the wires. Still other homeowners learn about electrical systems when they’re adding new, large appliances or other gadgets that consume more power than existing items. These devices may continually cause power outages in the house, such as tripping the circuit breaker or popping a fuse. When it comes time to update your electrical system, remember that it is not a do-it-yourself job. Hiring a licensed electrician is vital for proper safety.